I was interviewed by Kutlwano Masote of Classic 1027, in his series called “Master Class”. You can hear it as a podcast. Amongst other things, we discussed my 2016 work “Valley Of The Shadow – Rites of Loss“, (also used for the ballet Bengingazi) and my upcoming score for “Frank and Fearless” the new feature movie from Leon Shuster (more here soon). 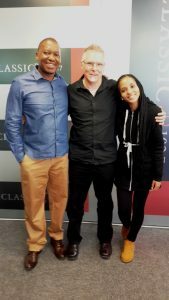 On the left, presenter Kutlwano Masote, myself, and producer Keitumetse Mokgoro at the Joburg studio of Classic 1027.